I was lying in bed a month or so ago, bummed about this terrible wait for our daughter, and the song "While I'm Waiting" by John Waller came on and really convicted me. I felt that it was a direct 'wake up' call from God that I could either continue being sad and "waller" in self pity about this excruciatingly long wait for our Ruby-Grace OR I could come up with a way to serve those that I'm so passionate about-those that are also tired of waiting and some that may wait forever on families that will never come. And almost instantly, I thought of doing a shoe campaign for orphans, and being the "teacher" that I am, of course needed a catchy name for it. 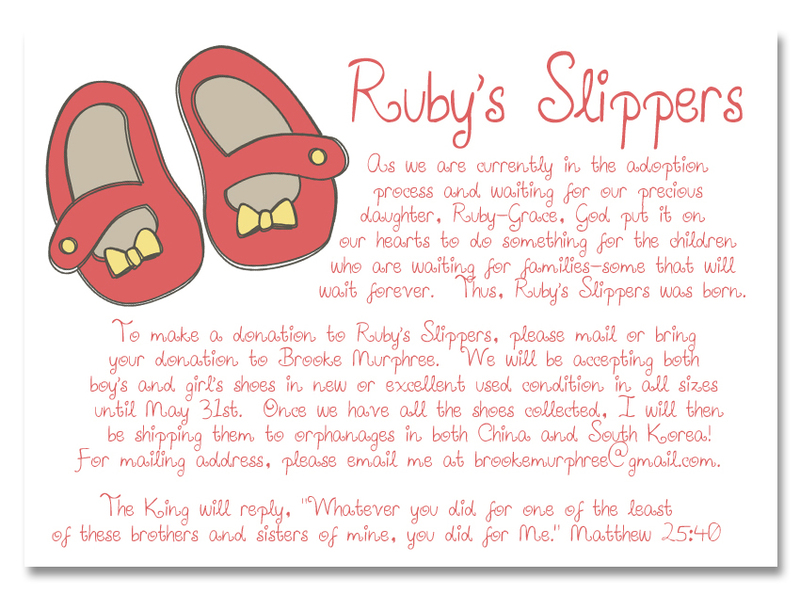 So, we lovingly named it "Ruby's Slippers" in honor of our sweet Ruby-Grace that we can't wait to meet!! My plan is to take donations of new or excellent used condition shoes until May 31st, and then ship them to an orphanage in both China and South Korea (Ilsan!) the first week of June. Thank you SO much for considering to join us in this campaign and for making the difference in the lives of these precious children!! Emailing you now for your address. Love the idea Brooke ~ way to listen to Him as you wait!